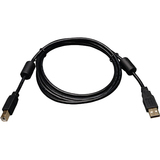 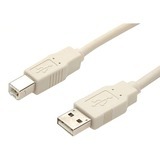 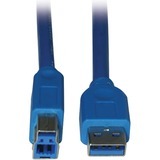 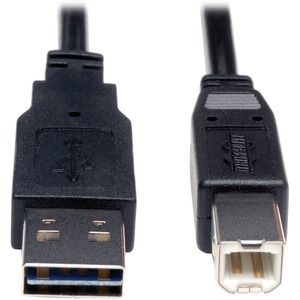 Tripp Lite's UR022-003, 3-ft. USB2.0 A/B device cable, with Universal / Reversible "A" connector, meets or exceeds USB 2.0 specifications. 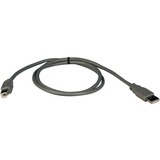 No guessing on how to plug into the Computer or Hub port... Connects in either direction. 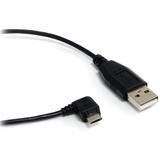 Backward compatible - can be used with older USB1.1 applications as well. 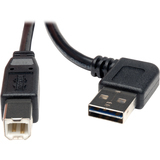 All Tripp Lite USB 2.0 cabling include superior foil shielding for reliable, error-free data communications. 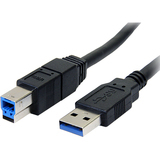 The significantly faster data transfer rates of USB 2.0 (up to 480 Mbps) make them perfect for multimedia applications. 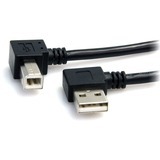 Features nickel plated connectors and gold plated copper contacts for superior conductivity. 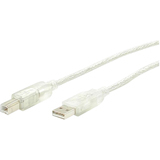 The cable is manufactured with molded connectors and integral strain relief for extra durability and long life.